As the Chicago area prepares for what could potentially be life-threatening cold, there's a lot you should know to keep you and your loved ones safe. The impending bitter blast has already closed schools and businesses, forced modified transit schedules, and prompted a disaster proclamation in the state. 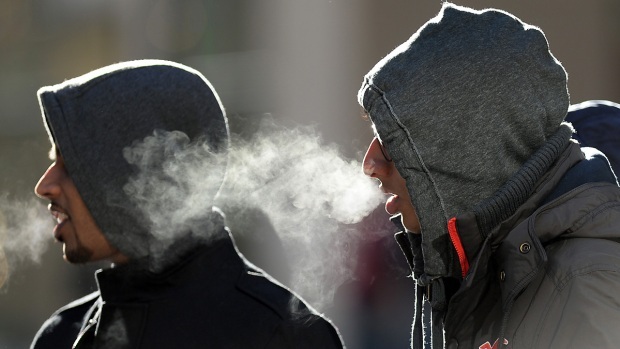 A Wind Chill Advisory began at 4 a.m. across the area. It will continue until 6 p.m., when a Wind Chill Warning takes effect for the entire metro area. The warning will remain in effect through Thursday morning. Temperatures are expected to fall during the late afternoon and early evening hours Tuesday, with wind chill readings dropping as low as -35 on average. Air temperatures will plummet to -18 in the city and near -25 inland by dawn Wednesday, making for wind chill values between -45 and -55 across the area. Some locations could see wind chills as low as -60 Wednesday morning. Throughout the day, the area will see little to no relief before potentially record-breaking temperatures settle in for the evening. Lows between-20 and -30 degrees are possible, though the wind will be light to calm so wind chill readings won't be quite as harsh. Thursday looks to start out with temperatures between -20 and -30 degrees, becoming cloudy and less bitter in the afternoon with light snow developing. By Thursday afternoon, temperatures will likely reach -5 inland and possibly even climb above zero in the city. Snow is expected to continue through the evening with some accumulation likely. NBC 5 Storm Team meteorologist Brant Miller explains exactly what wind chill is and how it is measured. HOW FAST CAN FROSTBITE HAPPEN? Frostbite will be a major concern across the area, as it can happen in a matter of minutes. On exposed skin, with wind chill values between -10 and -20 degrees, frostbite can happen in 30 minutes. As wind chills climb to -20 to -30, it could happen in as little as 10 minutes. For wind chills between -30 and -40 degrees, frostbite can occur anywhere from five to 10 minutes. And once wind chills reach -40 and below, frostbite can happen in two to five minutes. Parts of the body most commonly affected include the face, ears, hands and feet. Frostbitten skin is whitish and stiff, and the area will feel numb rather than painful. To treat frostbite, warm the affected part of the body gradually. Wrap the frostbitten area in blankets, sweaters, coats, etc. and seek medical attention immediately. Do not rub frostbitten areas because the friction can damage the tissue. •	Infants may experience bright red, cold skin. 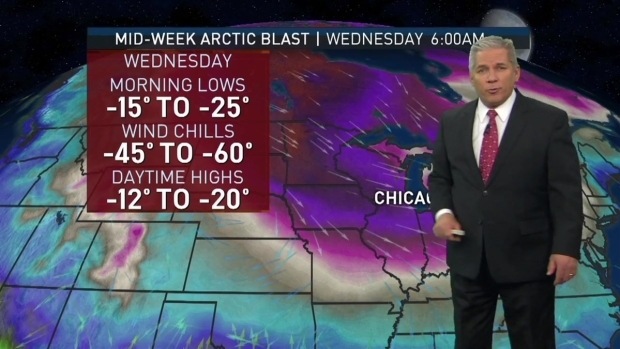 WILL THESE BE THE COLDEST TEMPERATURES IN CHICAGO HISTORY? With many public centers closed, designated warming centers will be the best place to keep warm. In addition to those, numerous churches, park district facilities and mobile warming centers will be made available in this week's cold. In addition, the Illinois Emergency Management Agency has a list of identified warming centers in Illinois, listed by county. If there is not a warming center near you, call your county emergency management agency for additional assistance. Additionally, all Illinois Department of Human Services (IDHS) offices serve as warming centers during regular business hours. 3-1-1: Call this number to find the closest warming center or shelter near you. You can also call this number if you would like a well-being check on someone. Emergency alerts in Chicago are available at Notify Chicago. 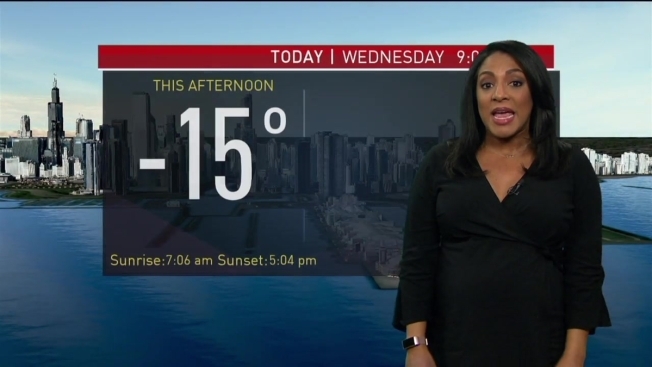 If you don't have heat in your Chicago building, you should first contact your landlord. If that doesn't work, call 3-1-1. For the latest severe weather alerts in your area and updated information on closures, safety tips and more, you can always download the NBC Chicago app. Our Storm Team 5 Meteorologists will have team coverage to bring you the latest information throughout the day. For an update list of school closings, click here. For the latest list of businesses and locations closed during the cold in the Chicago area, click here. Transit agencies across Chicago area prepping for the cold weather and the complications that could come with it. Metra has announced a modified schedule and will be running trains slower than normal, which could lead to travel delays. For those who must take Metra, Amtrak, the Chicago Transit Authority or Pace buses, leave extra time and dress appropriately. Click here for updates from transit agencies across Chicago. If you need to be outside, the following suggestions from the governor's office will help keep you warm and protect your body from excessive heat loss. •	Wear several layers of lightweight clothing rather than one or two layers of heavy garments. The air between the layers of clothing acts as insulation to keep you warmer. •	Cover your head. You lose as much as 50 percent of your body heat through your head. •	Wear mittens rather than fingered gloves. •	Wear warm leg coverings and heavy socks or two pairs of lightweight socks. •	Wear waterproof boots or sturdy shoes that give you maximum traction. •	Cover your ears and the lower part of your face. The ears, nose, chin, and forehead are most susceptible to frostbite. Cover your mouth with a scarf to protect the lungs from directly inhaling extremely cold air. State and federal agencies encourage people to minimize travel in extreme weather conditions, but if driving is necessary, they advise you to do so during the day, on main roads if possible, and to inform others of where you are going. Don't forget to keep your cell phone charged, and throw an extra cell phone charger into your car. However, when temperatures plunge, experts advise against leaving cell phones, tablets and musical instruments inside a car because they can damage in the frigid cold. Canned drinks or food, wine bottles and glass jars should also be taken out of your vehicle as they pose an exploding hazard that could leave you with a sticky mess. Learn more about what not to leave in your car here. Find the water shut-off valve in your home in advance of a water emergency, so you know where to go if a pipe bursts, officials advise. If you are going away for an extended period of time, be sure to maintain adequate heat inside your home at no lower than 55 degrees. In the midst of a brutal winter blast, Chicago area residents will also need to take extra precautions to keep their pets safe. LeeAnn Trotter has the latest on tips for keeping pets safe in the cold. Some shelters also offering temporary housing from the cold for cats, dogs or small companion animals. If you or someone you know needs to use this service, check your area shelters.